Save incoming shipping boxes so they can be reused for outgoing shipments. In order to make sure you have enough boxes, retrieve shipping boxes from other people in the building. These can be found from other labs, or through building operations personnel. 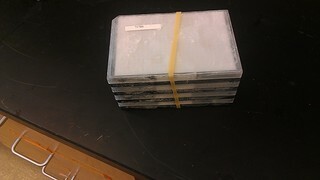 Inventory the plates to be sent out and place them in an easily accessible location in a freezer. Find a suitable sized box for shipping. The box should have a cardboard exterior with a Styrofoam interior. The box should hold twice the size of the contents you wish to ship. Find the original cardboard sleeves the plates were shipped in, or find equally sized sleeves. Rubber band the plates together so that the band fits tightly, and place them in the cardboard sleeves. Place the cardboard sleeves inside the Styrofoam box to make sure there is equal volume remaining to add dry ice pellets. It is better to have a box that is oversized than undersized. Add a layer of dry ice pellets to the bottom of the Styrofoam box. Place the cardboard sleeves with the plates inside, and fill the remainder of the box with dry ice pellets. Cover with the Styrofoam lid, and tape the cardboard flaps well. If reusing an old dry ice shipping box, cover the old shipping labels and information. You can use tape or a marker to cover everything. Place a new Dry Ice Symbol sticker on the box. If it already has one on it, put the new sticker over the old one. Label the sticker with the weight of dry ice in kilograms. Place the shipping label on the side of the box. Avoid placing it on the top. Deliver the package to a location that will ship it overnight.